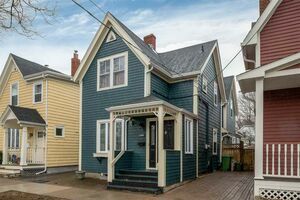 1020 Bellevue Avenue, Halifax (MLS® 201906498 ) Here's an amazing opportunity to build your dream home, on a beautiful tree lined, quiet street, in the sought after South end Halifax. Walking distance to hospitals, Universities, and shopping. Seller is prepared to build your dream home with the current requirements for $1,599,000 (plans and finishes to be agreed upon between parties): Land size: 55’ wide and 110’ depth. Total approximate square foot 6,102 Sq. Ft. ZONING R-1A, BY-LAW AREA – Halifax Peninsula By-Law Code: Maximum gross floor area (GFAR) of the house to be 3,356 sq ft (excluding basement underground and low ceiling below 6’.3976” GFA and unfinished attic that is not attached with staircase). Maximum allowable Footprint of the house (lot coverage) is: 2,135 sq ft (excluding uncovered areas). Maximum height: 35’ (Maximum height shall be measured as defined on map ZM-17 in bylaws) TLA can be built up to 4600 sq ft. (including basement) Minimum Both side yards to be: 5'6" Minimum Front yard: 20’ Minimum Backyard: 20’ Final approvals and permits must be obtained by HRM.